ABOUT: In order to save their home from foreclosure, a group of misfits set out to find a pirate's ancient valuable treasure. 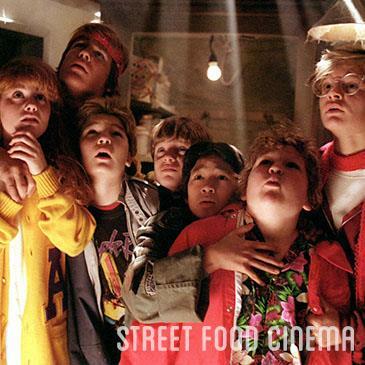 LIVE MUSIC: Visit www.streetfoodcinema.com/the-goonies/ for the most current Live Music listing! FOOD TRUCKS: Visit www.streetfoodcinema.com/the-goonies/ for the most current Food Truck listing! PARKING: Suggested lot on site. Enter from Culver Blvd. or Coombs Ave. Lot not owned or operated by SFC. DOGS: No dogs allowed at this location. Sorry for the in-canine-venience!